This is a listing of unusual and legalistic terms and phrases used on this website that may not appear in standard on-line dictionaries. Useful legal dictionaries include the Law.com Dictionary and the Nolo Press Legal Glossary. Some terms are described in detail on the Frequently Asked Questions page of this website. If you have questions about anything posted on this site, please contact us. Accessible prescription information refers to prescription labels in formats other than standard print. The term also refers to different formats for other written materials that are given to a patient with prescription medication. Accessible prescription information includes talking prescription labels as well as braille and large print labels and other information. Accessible prescription information iallows blind and other print disabled people to safely and confidentially take prescription medication. Read more about accessible prescription information and the vendors that offer it. Attorney-client relationship means the relationship that people have with a lawyer when that lawyer is doing work for that person or might do work for that person. There are many ethical and other rules that apply to an attorney-client relationship. One of the most important rules is that information is kept confidential. Binding Settlement Agreement as that term is used on this website is a written document that resolves a dispute between two or more parties. The term “binding” is used to indicate that the people or organizations signing the document are bound (required) to carry it out. CAPTCHA is an acronym for “Completely Automated Public Turing test to tell Computers and Human Apart”. It is a security measure designed to prevent computers from hacking into a site. A visual CAPTCHA has distorted letters or numbers that a computer user is asked to copy into a text box. A person with a visual impairment cannot read a visual CAPTCHA and is therefore unable to access content or services on a page with a visual CAPTCHA. Think of a visual CAPTCHA as a Do Not Enter sign on the information highway. Alternatives to visual CAPTCHAs that are accessible to many people with disabilities include audio CAPTCHAs and security measures that require users to answer a simple logic or mathematical question (such as “how do you spell red”). The best CAPTCHA is no CAPTCHA at all, because no CAPTCHA is accessible to everyone. Claimant is a term used in the Structured Negotiation process to refer to individuals or organizations that have a legal issue that they seek to resolve using Structured Negotiation. The equivalent of Claimant in the litigation process is “plaintiff”. A Dispute Resolution Method is a process that people use to settle legal differences. Filing a lawsuit and engaging in litigation is a common way for people to resolve legal claims. Structured Negotiation, practiced by Lainey Feingold and her Co-counsel, is an alternative dispute resolution method. Examples of other dispute resolution methods include arbitration and mediation. Large print refers to print that has certain characteristics making it easier for people to read. Those characteristics include the size of the font, the type of font, the amount of white space, and the use of formatting such as bold, italics and capitalization. Standards for large print documents can be found in the Best Practices and Guidelines for Large Print Documents issued by the American Council of the Blind. As used in the settlements reached in the Structured Negotiation process, a person with a visual impairment is any person who has a physical or mental impairment that substantially limits him or her in the major life activity of seeing. As used on this website, a Simplified Summary is a short summary of information on a web page provided when that page requires a reading ability higher than lower secondary education level (9th grade). The Simplified Summary does not require reading ability higher than 9th grade, after proper names and titles have been removed. The Simplified Summaries on LFLegal.com are designed to meet the requirements of Success Criteria 3.1.5 of Web Content Accessibility Guidelines (WCAG) 2.0. A standard print credit report is the credit report (also called a credit disclosure) that is mailed in print format by a credit reporting agency to a consumer requesting the report. A credit report is a document that has financial information related to a person’s credit history. As a result of the Accessible Credit Reports Agreement negotiated using Structured Negotiation, in 2008 credit reports will also be available in Braille, Large Print, audio, and in an accessible format on-line. Structured Negotiation is a way of solving legal issues without a lawsuit on file. 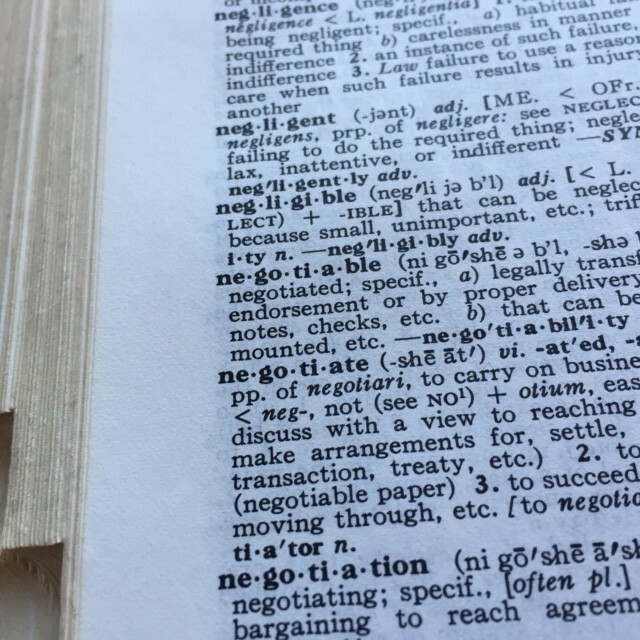 Read more about Structured Negotiations on the Frequently Asked Questions page. Read about Lainey Feingold’s forthcoming book on Structured Negotiation on the Book Page. A tactile point of sale device has numeric and function keys that a user can feel. A tactile keypad is different than a flat-screen device where the keypad is virtual, under a glass screen. A tactile keypad is arranged like a standard telephone keypad with the number 1 in the top left corner. There is a raised dot on the five key to enable a blind person to orient herself on the keypad. A tactile keypad has raised markings on the function keys, including a raised circle on the “enter” key and a raised “X” on the “cancel” key. These features enable a blind person to enter numeric information, including confidential information like a PIN number. A Talking ATM is an ATM that delivers all information and instructions necessary to use the machine audibly and privately through a headphone jack on the face of the unit. A Talking ATM has a tactile keypad so a user can independently and privately enter all required information and perform all transactions necessary to use the device. Read more about Talking ATMs.